I love this piece of art….I’m really not sure what else to call it. 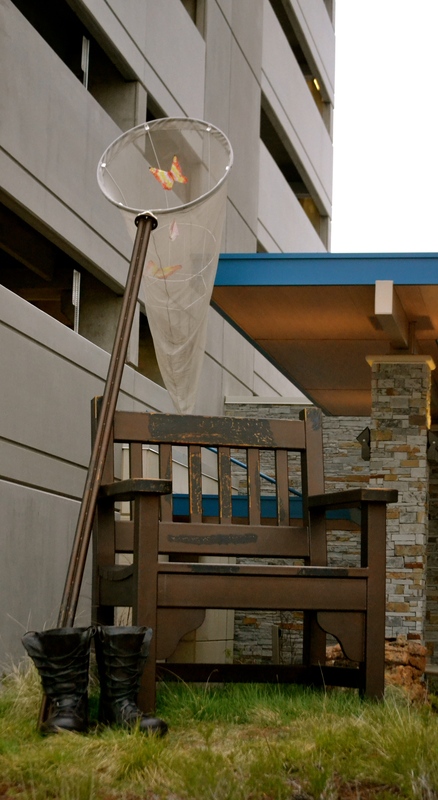 The chair, boots and butterfly net were installed a few years ago when this medical center, associated with our local children’s hospital, was built. While training for the 3 Day Breast Cancer walk we end up passing this chair at least once…and yes you guessed it…we stop for pictures! Today I stopped to snap a quick shot of the chair…too cold for anyone to sit for a pose. This entry was posted in Uncategorized and tagged 365 photos, photography on February 25, 2015 by treerabold. It IS art! Butterflies and all. Very cool, Tree.